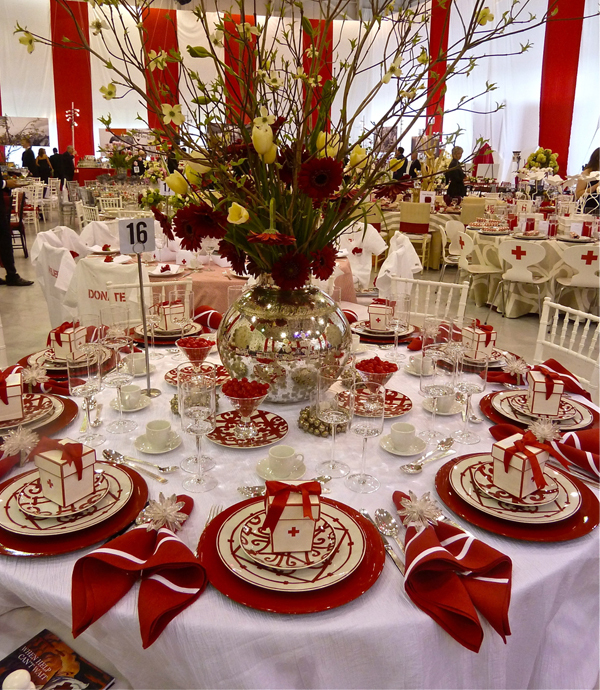 On April 28th, the Metro New York North Red Cross held its annual Red & White Ball, one of the largest fund raising events in town. 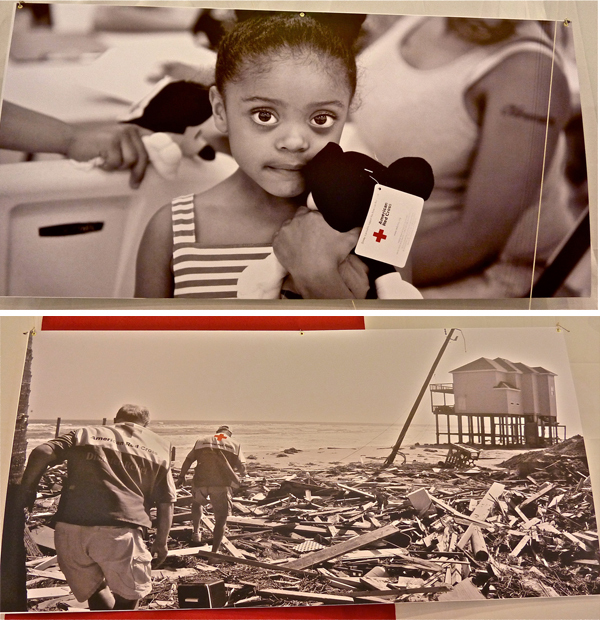 With over 460 guests, they raised more than $760,000 to help the Red Cross provide immediate humanitarian aid to those affected by emergencies and disasters. 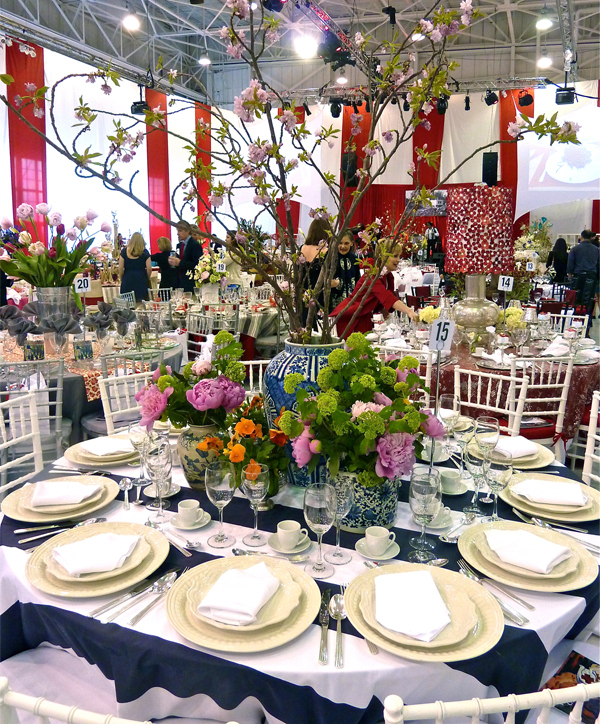 Held in the NetJets Hangar at the Westchester Airport, it is always fun to see the tablescapes generously created by local designers, organized with local media sponsor Cottages & Gardens. Local retailer Hoaglands, about whom I have written on several occasions, designed two stunning tables. Their first was one of my favorites of the evening. 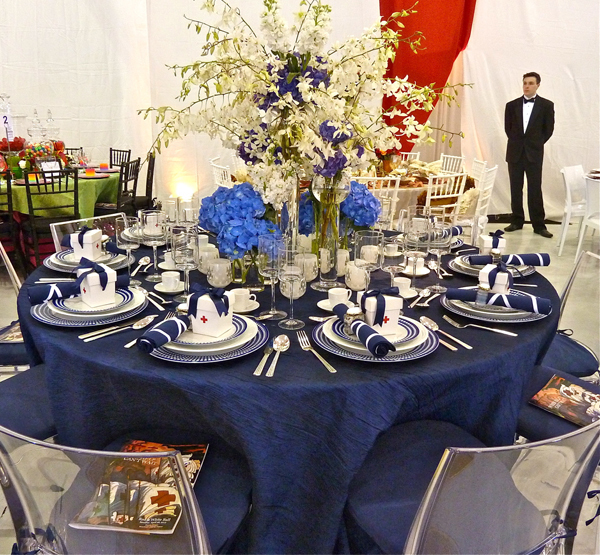 In crisp spring-appropriate navy and white, it featured l’Objet’s fresh Perlée Bleu pattern with navy and white linens and jewel encrusted napkin rings. 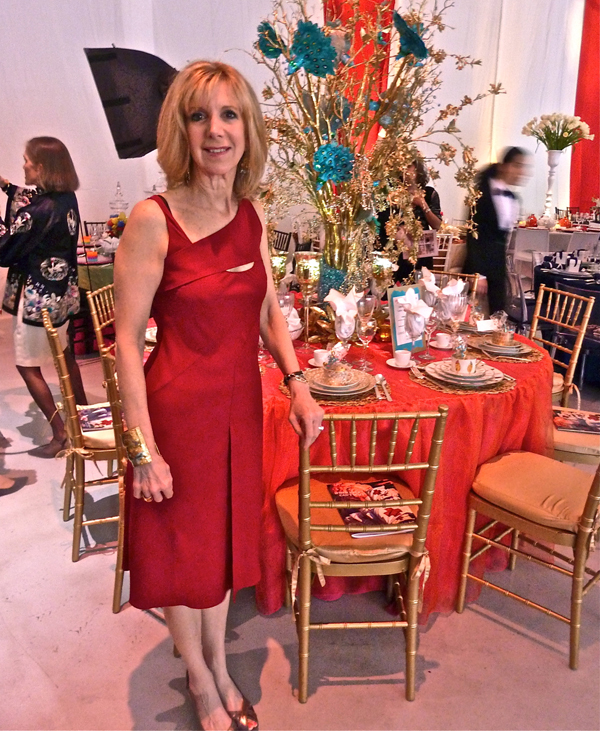 Their second table was the opposite version in red and white – with the fabulous Hermès Balcon du Guadalquivir dinnerware – the same pattern that blogging friend Melissa Morris featured in her Park Avenue Fund table. Hoaglands is a great source for tabletop as well as a wide variety of decorative accessories is a very dangerous visit for me!! Designer Carey Karlan, just named a finalist in the Interior Design category of the CT Cottages & Garden 2012 Innovation in Design awards, gave her design firm the title Last Detail for good reason. 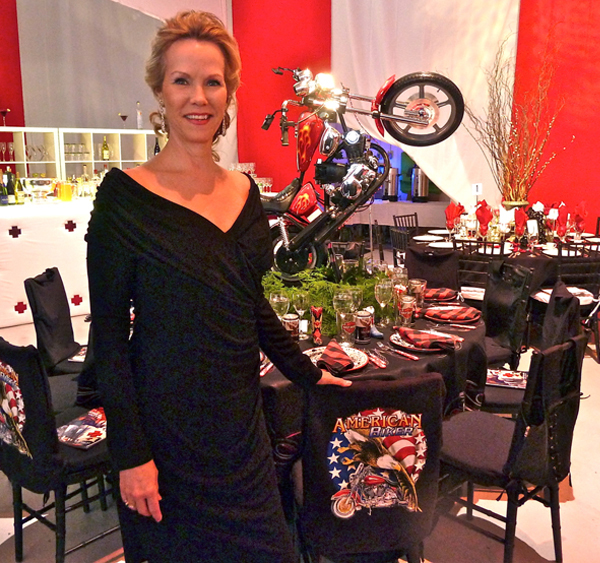 Her sparkling red themed table featured incredibly detailed handiwork as she individually glued hundreds of silk flowers on her light to create a dramatic centerpiece. And for a truly coordinated design-to-fashion segue, she continued the theme by stylishly applying the same flowers to her dress as well! 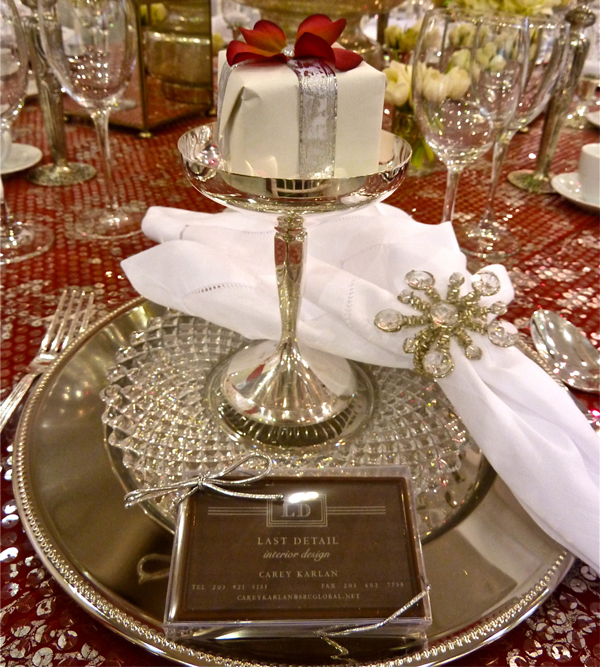 I loved that each placesetting featured a chocolate business card – what a great way to get your guests’ to remember your firm!! The working Harley was supported by a base made by local Sterling Cabinetry. Gracing the chairs were Harley t-shirts for the men and leather laced vests for the women. On a faux leather tablecloth, fabricated by Triple S in Norwalk, CT, Catherine glued iridescent decal flames (like used on cars) to create place settings for the dishes and around the hem as well. And to complete the authenticity of the scene, she even found Harley beer online! 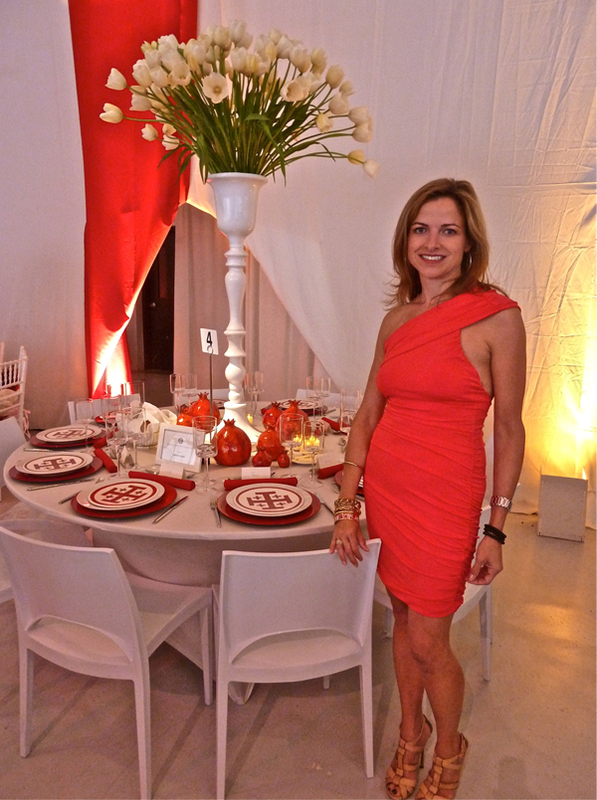 Carmina Roth, one of the designers from last year’s Rooms with a View, looked as sleek and modern as her table. 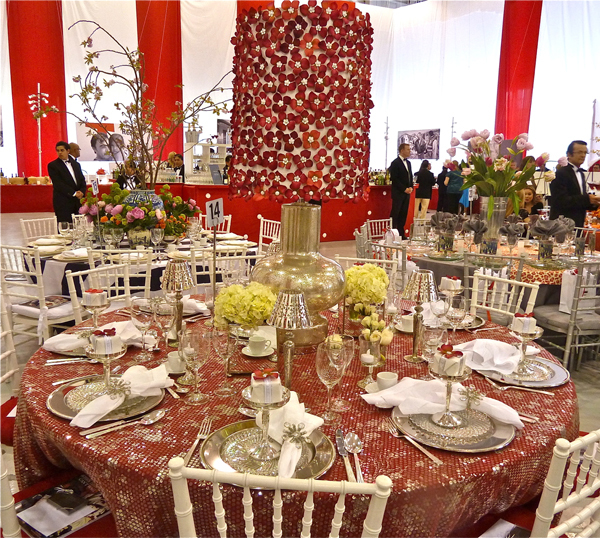 With a fabulous dramatic arrangement by Winston Flowers, her design had a strong yet pure and elegant aesthetic. Next Rooms with a View alumnus was Sam Allen. His classic table was reminiscent of the wonderful design he had done for the Southport show in the fall. Nothing says spring more than stripes and mixed with Chinese export patterns and peonies, it was a fresh take on classic. 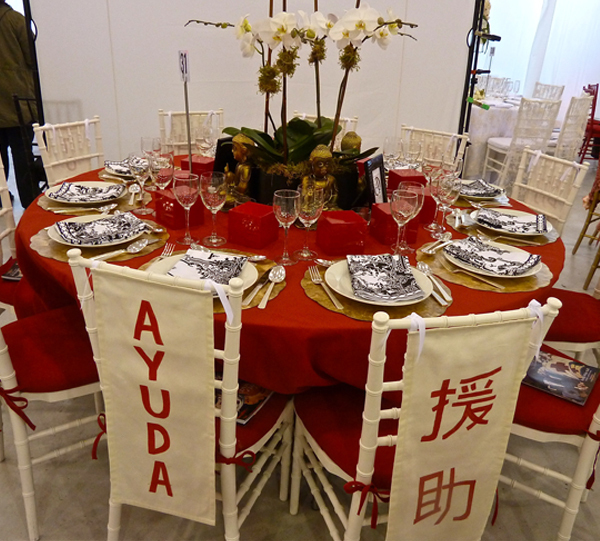 Rooms with a View alumna Olga Adler‘s zen tabletop featured messages of hope in various languages on chair back banners. 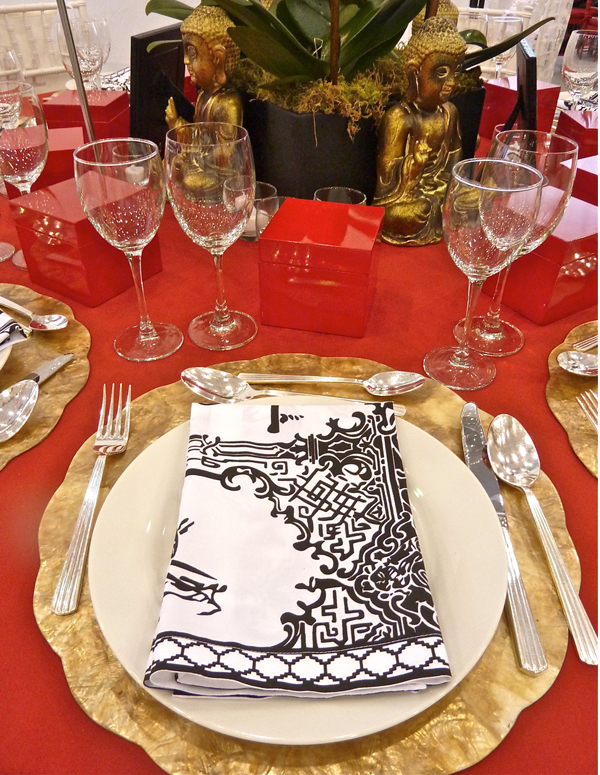 She successfully added to theme with exotic printed black and white napkins, gold buddhas, lacquer boxes and shell like mats. To round out the Rooms with a View alumni group at the event was Connie Cooper. The theme for her table was Mumbai Madness. 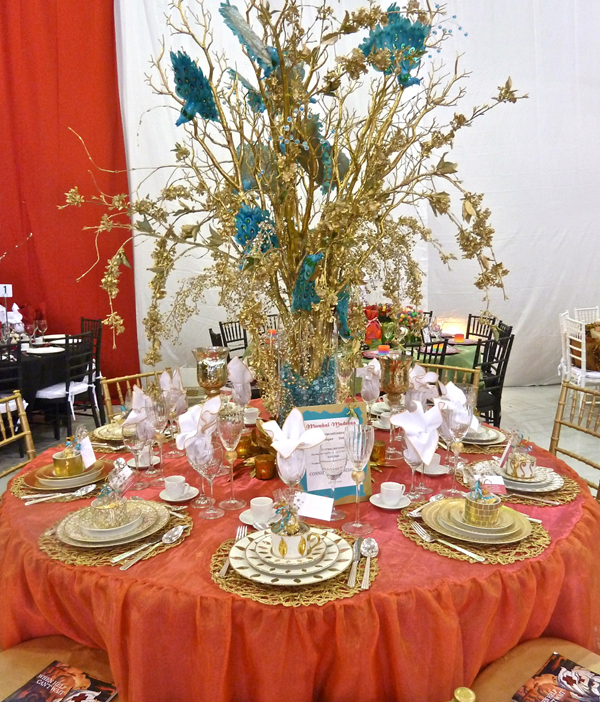 I of course loved the orange and turquoise colorway with a festive centerpiece she executed with Beth Vogl. 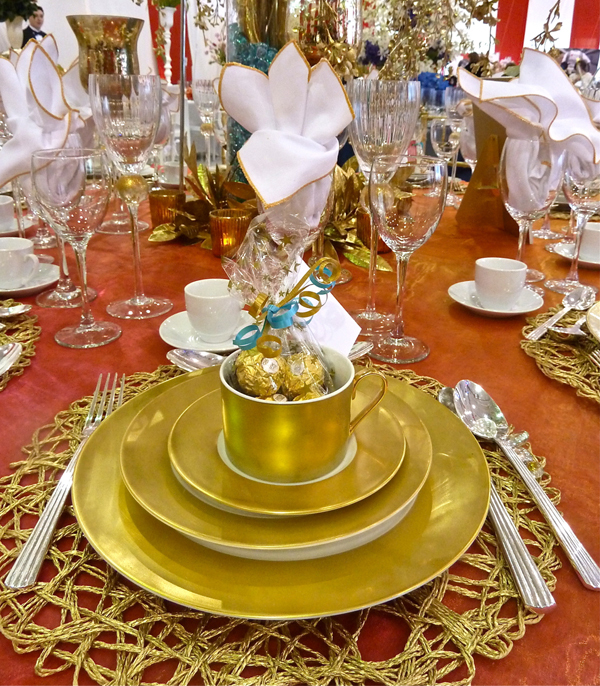 To add to the exotic appeal, she added an eclectic selection of gold dinnerware and crystal from The Whitney Shop with a tablecloth executed by to-the-trade resource Traditional Drapery. 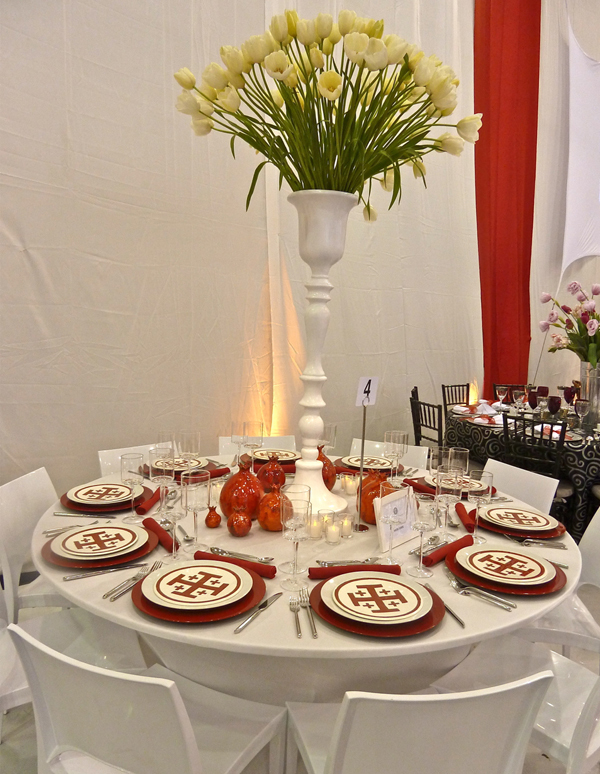 Stop back for more tables from this worthwhile charity gala! An Invite and What's on the Agenda! This entry posted in design, entertainment, interior design. 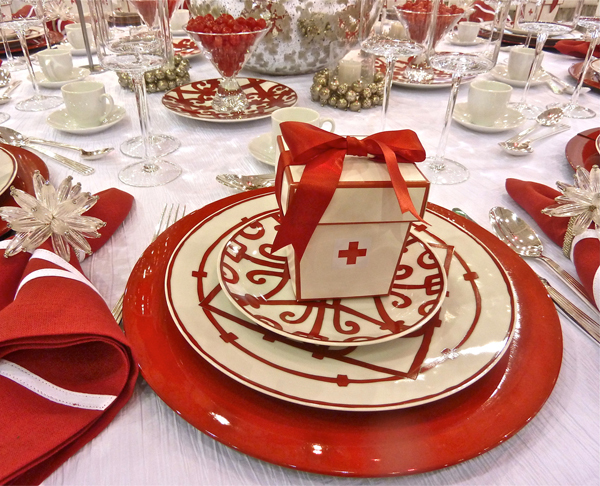 Entry Tags: Greenwich Red Cross Red & White Ball, interior design, Red Cross, Tabletop Bookmark the permalink. 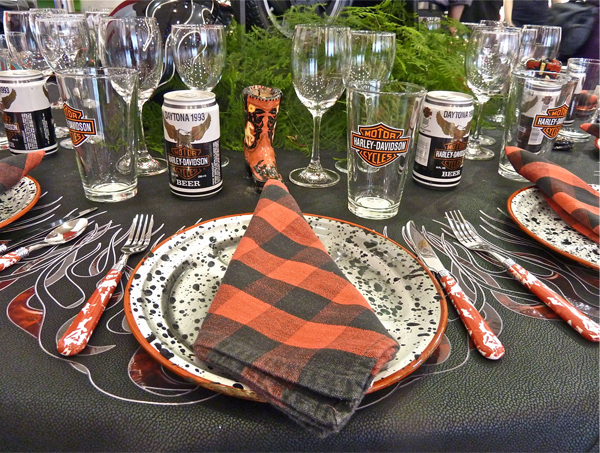 Amazing tablescapes , and my favorites are yours as well! A very worthy event and I am excited to see more! It is so enticing to see all the different results from the same table all in one big area,not to mention a great cause. Another lineup of fabulous tables capes, Stacey. I love the table with the Hermes china. Gorgeous. So happy to see so many participating in such a good cause. 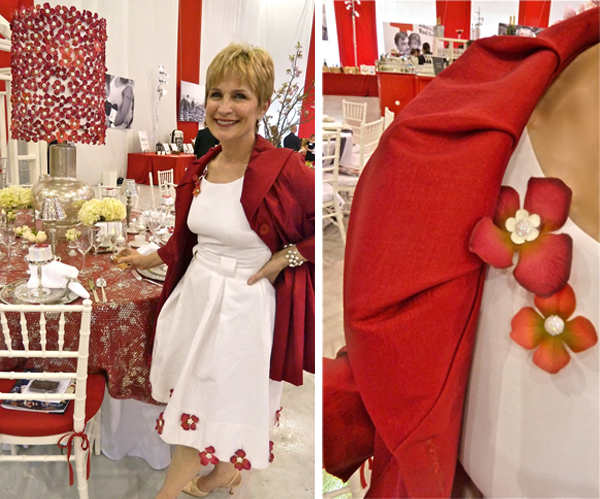 Fun tablescapes! Thank you for sharing..it’s like we were there. I hope it was a huge success, for a great cause! So sad to have missed this event this year as a spectator and a designer. Love Sam Allen’s pops of color and Caty’s tables always amuse! Just beautiful! 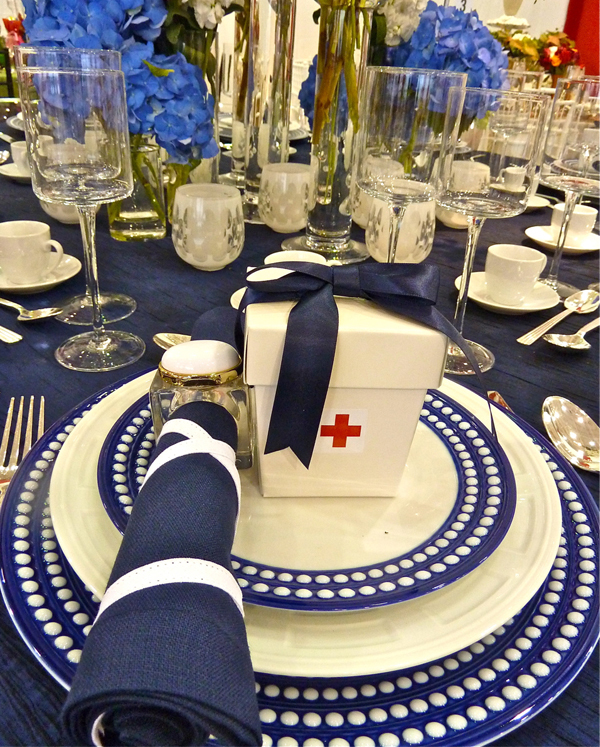 Love the Red Cross table with all of the blue and white. Great roundup! Sam Allen’s table is so fresh ! 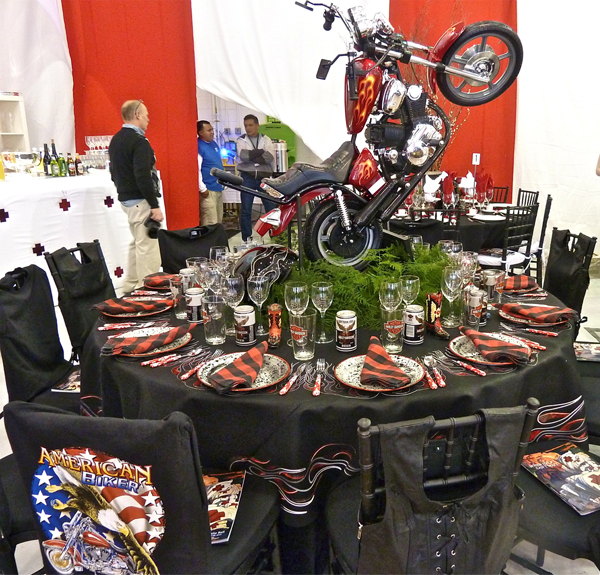 My fav – the Harley Davidson ride table! So unique! 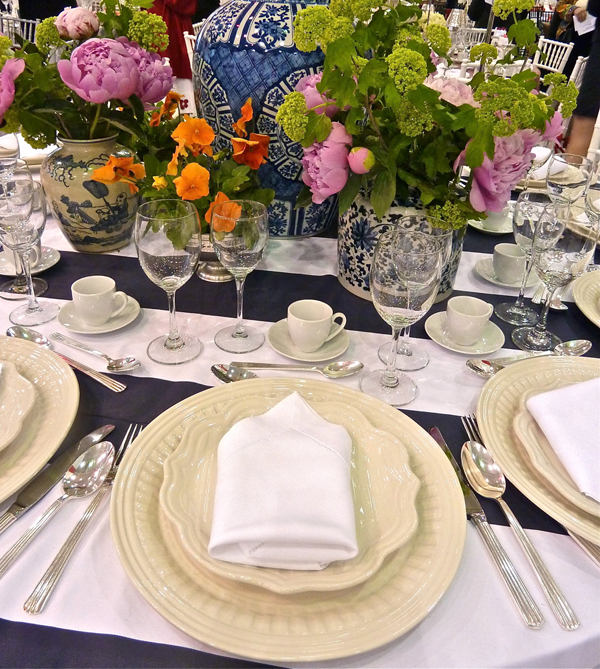 So happy to see all the amazing tablescapes. I so wanted to go but we had our club Centennial that night and I was on that committee. Such talented designers putting their talents to use for good. What could be better?! Each of the tables are so lovely in their own special way. Does anyone recall the name of the band that night? They were amazing. Can’t help you on that one – I was only there for cocktails! 81 queries in 0.658 seconds.